On Sunday, December 31, 2017 at approximately 8:00 a.m., at 1004 West Camp Wisdom Rd, Dallas, TX., at the intersection of Camp Wisdom Rd and Polk St, an unknown suspect shot the the victim, striking him in the abdomen. 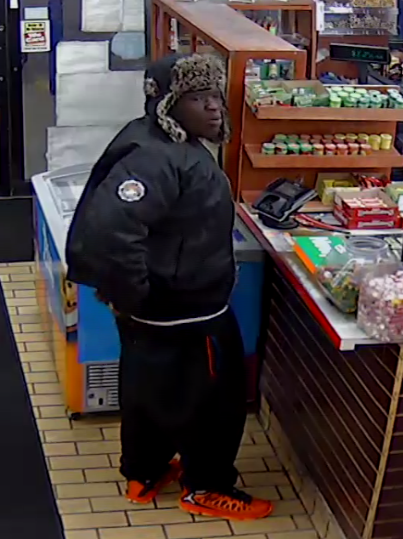 The suspect is described as a Black male, between the ages of 25-35 years old, standing between 5’07 -5’10” weighing at about 220 lbs. The suspect was wearing a black jacket, black jeans with red pockets, red/black shoes with a black/brown fur hat. If you have any additional information or possibly came into contact with the suspect, please contact Detective B. Billings #7626, (214) 671-3083 at the Dallas Police Department Assaults Unit.